He is holding a fundraiser at the King David Hotel in Jerusalem. It is distasteful for an American political candidate to hold a high-profile fundraiser abroad, implying a commitment to a foreign country as a means of reaching out to American interest groups (in Romney’s case, Christian Zionists among the evangelicals and the minority of American Jews who would be willing to vote Republican). Romney has broken his pledge of transparency and declared the fundraiser off limits to the US press. Romney won’t explain why he has abruptly gone back on his word, and closed the Jerusalem event to the press. There is a convention in US politics that you don’t criticise the sitting president, even if you are an opposition politician, while on foreign soil. Romney clearly intends to slam Barack Obama while in Israel. Romney is clearly holding the event in some large part to please casino mogul Sheldon Adelson, who first bankrolled Newt Gingrich and now is talking about giving $100m to elect Romney. Adelson is a huge supporter of rightwing Likud party prime minister Binyamin Netanyahu, and published a free newspaper in Israel to support all things Bibi all the time. Adelson is under investigation on suspicion of bribing Chinese officials in Macau in reference to his casino empire there. Since Adelson is potentially an agent of Chinese influence and is a partisan of one of Israel’s most rightwing parties, Romney’s indebtedness to him is disturbing. Israeli prime minister Binyamin Netanyahu is interfering in an American domestic election by openly favouring Romney over Obama. 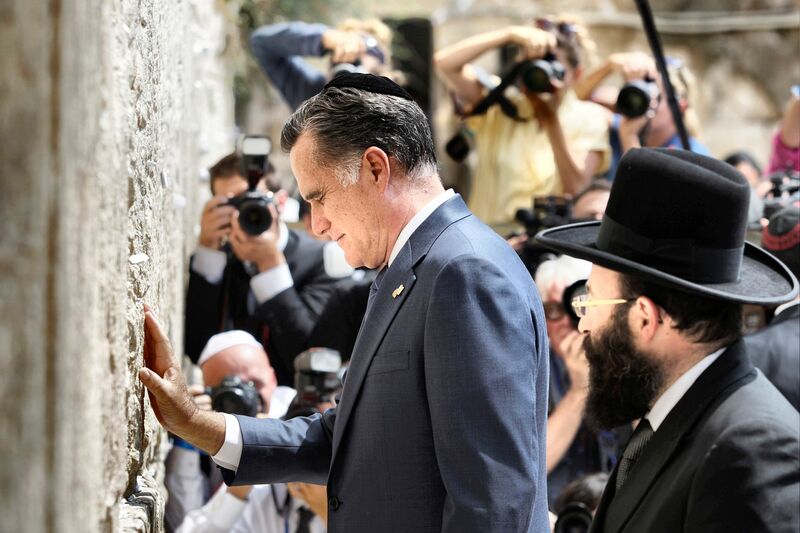 Romney is promising his donors in Jerusalem a war on Iran. When George W Bush promised his pro-Israel supporters a war on Iraq, it cost the US at least $3 trillion, got hundreds of thousands of Iraqis killed, destabilised the Gulf for some time, cost over 4,000 American soldiers’ lives and damaged American power and credibility and the economy. As Nancy Reagan said of drugs, so US politicians must say to constant Israeli entreaties that the US continually fight new wars in the Middle East on their behalf: “Just say no.” Instead, Romney is playing war enabler, and that abroad. Romney will not meet Mahmoud Abbas, president of the Palestine Authority, who actually was elected by Palestinians, but only with an appointed and toothless “prime minister” known for co-operation with Israel’s Likud. Romney will not commit to a two-state solution within 1967 borders or demand Israel cease illegal squatting on and unilateral annexation of Palestinian land. If he is going to this Middle East hotspot, why doesn’t he visit a Palestinian refugee camp so as to understand the nub of the dispute, instead of hobnobbing with the uber-rich in Jerusalem. The fundraiser is being held in the King David Hotel, which was famously blown up by the Zionist terrorist organisation Irgun in 1946, in a strike that killed 91 people and wounded dozens, many of them innocent civilians. Irgun leader Menachem Begin (later a leader of the ruling Likud party) hit the hotel because there were British security offices there, which were tracking violent organisations like his own, during the British mandate period of Palestine. He maintained that he called ahead to warn of the bombing, but that is just propaganda to take the edge off the deed – who in 1946 would have taken such a call seriously? When Netanyahu and other Likud leaders attended a commemoration of the bombing, the British Foreign Office sent over a sharp note of protest. I guess Romney is not finished with insulting London. There are no words to describe how much of a total jerk this man is. If this were not a public forum, I can think of about a dozen expletives I would love to use to describe this pathetic piece of garbage.